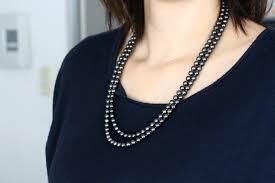 materfamilias inspired todays' windows, when she posted a WIW of herself dressed in her characteristically stylish way, out to the opera on a winter evening: a richly-patterned skirt, plush black cashmere turtleneck, and a necklace of pearls and lapis beads. Though it echoes the blue of her skirt, she was not entirely happy with the necklace's scale with her outfit. Ma went to the opera, but in matinée length. I commented that her necklace would be perfect with a blouse, among other necklines. Because she is petite, she could shorten it by an inch or two so that it "peeks out" at the right place—an idea she liked. Few necklaces work with everything, so when choosing, you have to think. 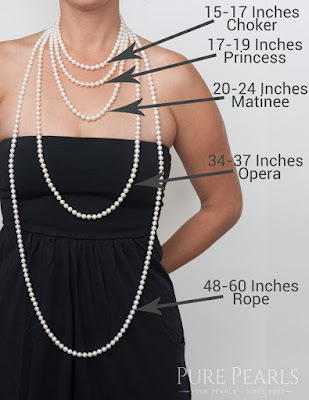 PurePearls provide a useful diagram of standard lengths, which illustrate where they sit on the body—a good start. But the diagram can't convey the most important factor: what suits your body, and its proportions. You can figure this out! It's just like skirt length: ask yourself, where do I want the eye to go? If you have a slender and average-to-long neck, a choker is chic: below, Keira Knightly in Tahitians. I'm going to gloss over them here, because many women past fifty find them short and uncomfortable. I dislike this jeune-fille name for this length, though it's the best-seller for a reason. It draws the eye to the collarbone area, a grace note for every woman, and it's easy to wear inside a collar or with round and v-necked tops. 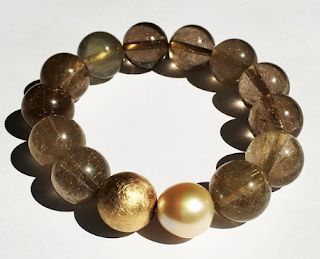 Another plus: eighteen-inch pieces are less pricey than the longer lengths, partly because of quantity of pearls, but also because matching is easier. 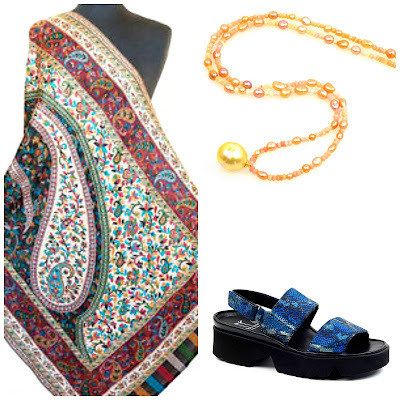 Tilda Swinton's exquisite mixed-colour opera-length Tahitians, worn in many scenes in the film "This is Love", inspired pearl lust even in women who had never thought of wearing them. "Opera" is a dated label; they can be worn as casually as Swinton did. Swinton is small-busted; voluptuous women can wear opera strands too, but try the longest end (37-40 inches) to avoid the "garland off the prow" look. That length will double nicely, too. I still get e-mails asking "Where can I get these?" The good news is that they are not hard to find; knowledgeable pearl dealers and jewellers can make up a similar strand. The bad news is the price for those glowing, intense colours in the already-costly Tahitian. 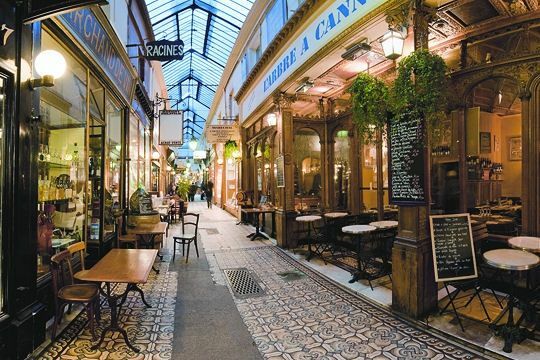 If you can bide your time, wait for well-stocked vendors such as Pearl Paradise, who periodically offer serious Tahitian sales, and then ask for a quote on opera length if none are listed in the sale. Or you might dive for your own in Tahiti, as Chantal did! Turtlenecks suit a chunky choker, layered multiples or opera length (and a pendant is a good idea). 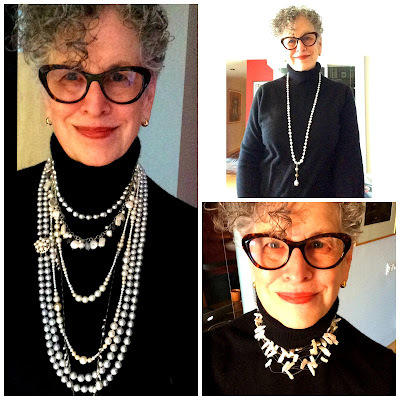 Examples: left, layered multiple lengths from princess to opera, various sources; top right: opera-length baroque South Seas with a custom-made Tahitian pendant, from Kojima Company; bottom right: choker of stick pearls on filament; Basia Design. 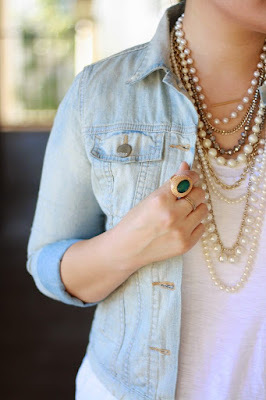 Have your necklace made the right size for the tops you wear most. If you're not sure, experiment with a cheapie string in plastic or glass—whatever you can pick up at a thrift or dollar store—with beads the same as the pearl size. Try that with your tops, till you get that "this!" sense, and then, buy or have yours restrung to that length. You might also enjoy Imogen Lamport of InsideOutStyle's article "Where to End Your Necklaces" and her illustration of necklines and necklaces that work with them. Great tutorial, so useful for any type pf beads and necklaces in general. And I love the photos of you in pieces from your collection, especially the multiple strands. You pull this off so well. This is really helpful. My mother loved to make necklaces, and she generally made them opera length (not until this blog did I know what to call that length). Most do not look good on me, and now I know why. I'm short (5'2"),very broad shouldered and have a medium bust-- what would look best on me? LauraH: Nd useful for beaders who are making pieces for others. My friend who makes spectacular necklaces makes nearly all at 18-20 inches. Lynne L.: Somewhere around 18", though you should experiment, as I described, because even one inch can make the difference between pleasing and it looking like it's "someone else's necklace". It is not your height- It is were the eye goes, no matter how long your torso is, and how the necklace sits in your preferred necklines. Also, the girth of your neck will change the proportion, 18" does not land the same place on everyone. Also (no one ever thinks of this) if you gain or lose around 15 lbs or more, the necklace will sit differently. Reading your comment on that WIW post of mine was a real SMH moment -- How had I not known or at least intuited that the problem was the length? Or, at least, I'd remarked on the awkwardness of the look a few times, but then either ignored the problem and wore the pearls anyway (rarely, I must admit) or, more often, simply tucked them back in their case for another day. Especially because of the story of their gifting, I felt guilty about this, but until you aimed your jeweler's loupe my way, it never occurred to me that this was an easily fixable problem. Top of my list now: getting this necklace shortened. Thank you! materfamilias: That is a beautiful piece (as well as sentimental) and I hope you show us you wearing it when it's shortened. Thanks for this very interesting and informative post. Very helpful and very true. I just took some large silver beads to be restrung- they had broken- and the jeweler asked if they were all there. I assured him they were and he said “o, it looks like enough for a choker.” Well, I have a long face and a long neck...so I wear my necklaces pretty short to stop the eye. Not quite a choker, maybe a Princess length. But the length that works for me. Thank you for this post. My Kojima necklace, which I love, is between a checker and princess length on me. (Now I know I need to lose 15 pounds to make it look longer.🙂) But, it feels too short and this post confirms my suspicions. I am waiting for Sarah to return from the Tucson show and will ask her to reno it for my current life and body. I also love that you included Tilda Swinton. You admire Jane, (as do I), but I want to be reincarnated as Tilda. The pearls on her are icing, in my opinion. I also forgot to add that you look beautiful in these pictures. It has nothing to do with the pearls. Just a lovely woman at any age. You look stunning. Love the array of pearls worn with the turtleneck. Super glam yet easy-dressing. Nelson Bartley: Knowing your length, especially when it is a non-standard such as "a little longer than a choker", or "short end of opera" is super useful and prevents mistakes. Leslie Milligan: Tilda Swinton has a very particular and fey beauty- as well as that talent. This was not my favourite film of hers, but I loved the character's costumes. You are lucky you got the pearls from a specialist (and especially Sarah), as she has the stock to extend your necklace, and the eye. Points out yet another reason to not buy pearls from a department store or big-brand jeweller who could never do that and most of the time has little interest. Vancouver Barbara: Jackie Kennedy once said that "pearls are always appropriate". They are also always fun to wear, if they are "you" and I especially like the more unusual but not necessarily expensive varieties and shapes.